Patric gives a lecture demonstration at UIUC. at Urbana-Champaign Il. Yatin Vaid accompanied Patric on the Tabla and Retnem Potti (a long-time student of Patric's) was on the Tanpura. A tough act to follow. Patric tells a funny story about having to follow a Kenny Rogers act with an audience all fired up by the famous country western singer. Patric Playing Yaman Kalyan with a young Khader Khan. I believe these videos where made to showcase Kander on the tabla. There aren't that many official recordings of Patric's work. Fortunately there are unofficial recordings and some bootleg copies (thanks to Brian Dering a long time friend and sound technician) The tracks below have been remastered, cleaned and edited May 8 2009 by Brian Dering and Sam Beckley at Gremlin Studios - Aurora Illinois. Track 3 Bhatyali Dhun: Patric Marks, Sitar - Rick Schafer, Tanpura - Time 4:05. These were recorded at Griffith High School in Griffith, Indiana on October 10, 1973. 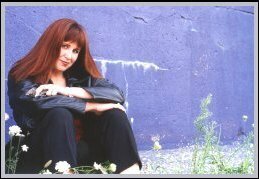 Original mix and recording by Terry Schafer. Rick Schafer and his brother Terry provided these wonderful recordings they preserved all these years. Their assistance in providing a clean copy was instrumental in getting this project off the ground. Track 5 Ragamala (Garland of Ragas): Patric Marks, Sitar Shayam Kane, Tabla - Retnem Potti, Tanpura - Time 11:27. These were recorded in 1995 at a special concert for Patric's Guru and Ustad, Ustad Ghulam Hussain Khan during his visit in the United States. Original mix and recording by Brian Dering, Patric's Engineer. Track 6 Oh Nodi Re by Hemant Kumar: Patric Marks, Sitar Shayam Kane, Tabla - Retnem Potti,' Tanpura - Time 4:04. Recorded at the 1995 concert for Ghulam Hussain Khan. This is Patric's interpretation of the Hemant Kumar melody from the movie Siddhartha based on an old folk tune. Original mix and recording by Brian Dering. Track 7 Nanda Nandana Bhajan: Patric Marks, Vocal and Harmonium with "Geetamritham" the bhajan group of the Amma Center of Chieago - Time 2:47. Recorded September 2008 at a special program honoring Mata Amritanandamayi Devi's birthday. 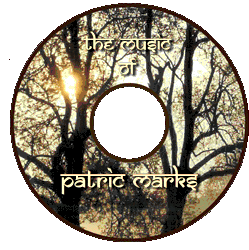 Patric directed and composed for, played harmonium and sang with this group for years. This bhajan, one of Patric's favorites. 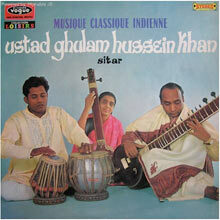 Here are some recordings by Gulam Hussein Khan, Patric's teacher and Guru. It's interesting to note some of the similarities in sound and technique.